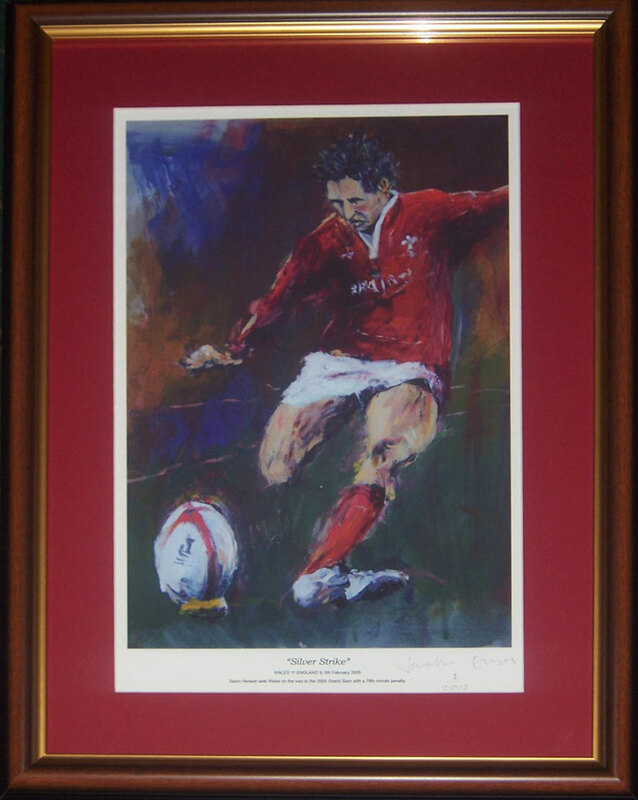 Wales v England at the Millennium Stadium and with only 4 minutes remaining Wales are down against the old enemy by just one point, up steps the man in the silver boots, the whole of the Millennium Stadium is on the edge of it's seat, you can hear a pin drop in the thousands of pubs around Wales all of which are packed to the rafters, wherever Welshmen are located around the world, they are glued to their TV sets and willing this one kick over, this is the moment, one small moment in time, ........................... this is the moment we've all dreamed of for the past 6 years, not since Scott Gibbs crashed over at Wembley have we conquered the old enemy. It only needs one kick, straight and true and we can again taste the sweetness of victory. One kick and the game is ours. It's Gavin's first kick of the game, but will he have the nerve to send it over, it's not an easy kick, he takes his time, he completes his run up and with one 'silver strike', the ball sails through the uprights. 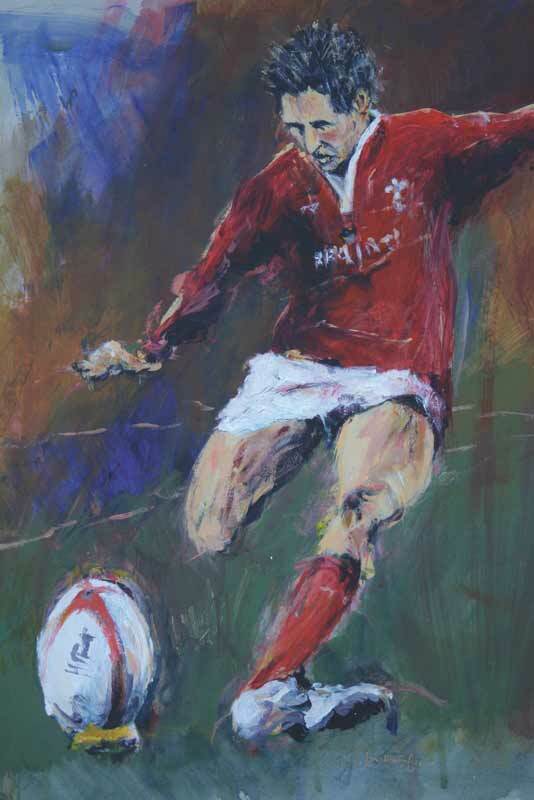 The whole of Wales erupts with fevered joy and the men in scarlet are on their way to the most glorious of victories. 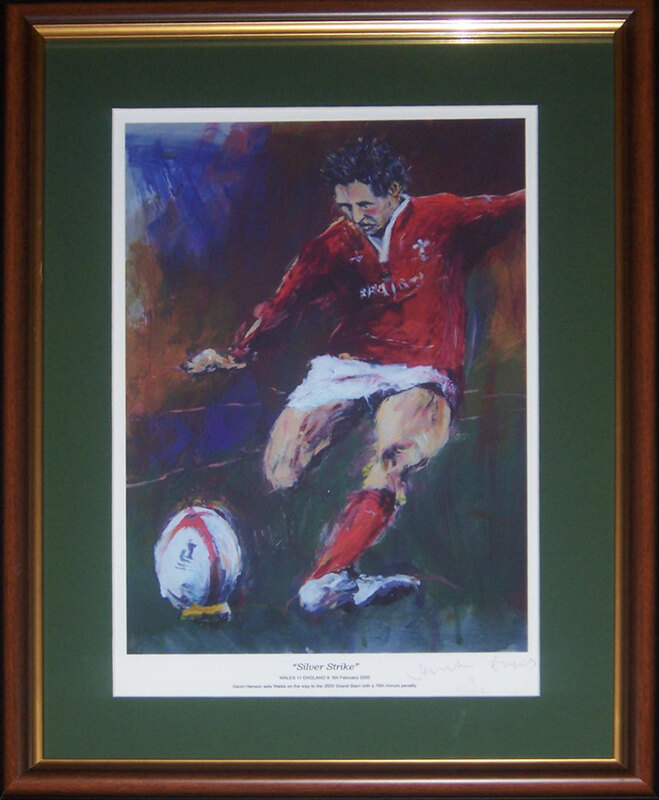 It's a triumph that sets Wales on their way to a series of wonderful wins culminating in the 2005 Grand Slam victory against Ireland ! What a season ! 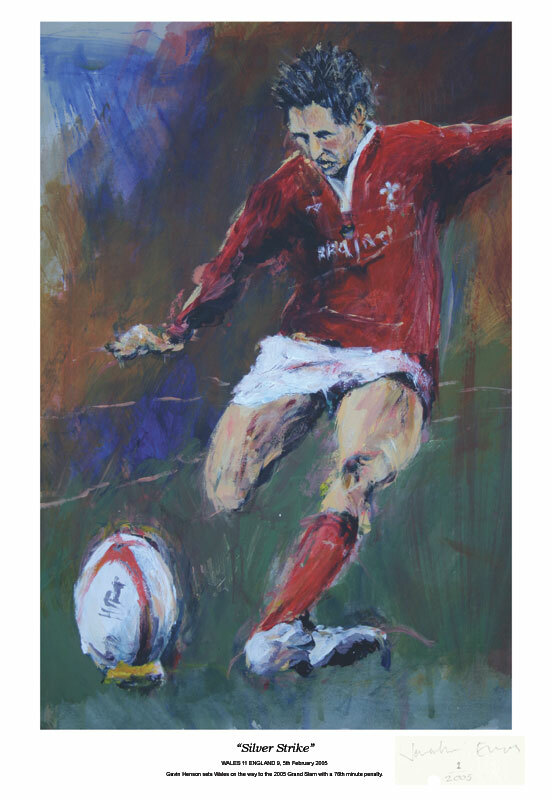 The artist Jonathan Evans was at the game and he has been inspired to capture this moment in time. 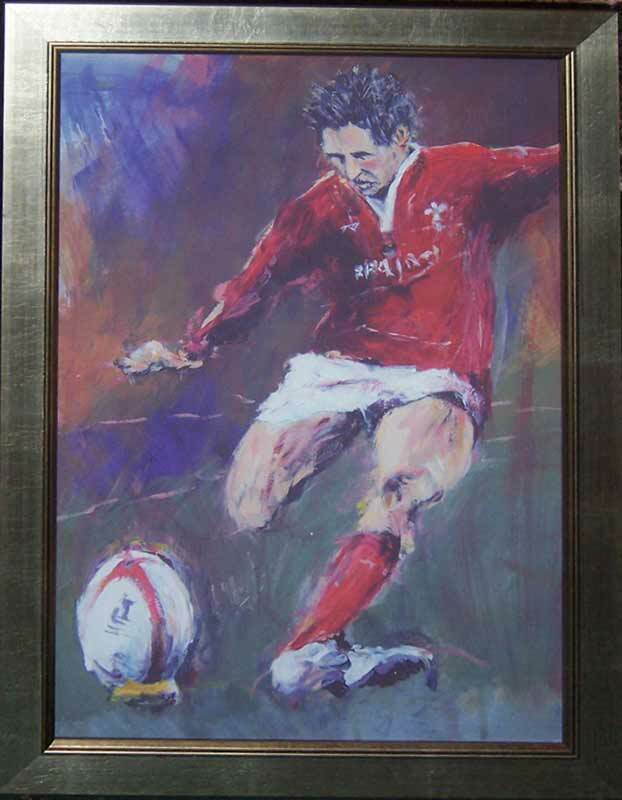 Jonathan's use of colour and the way he conveys movement makes him one of Wales' top sporting artists. He has captured that moment, the moment just before the strike of the ball, the rest 'we all know' is history. 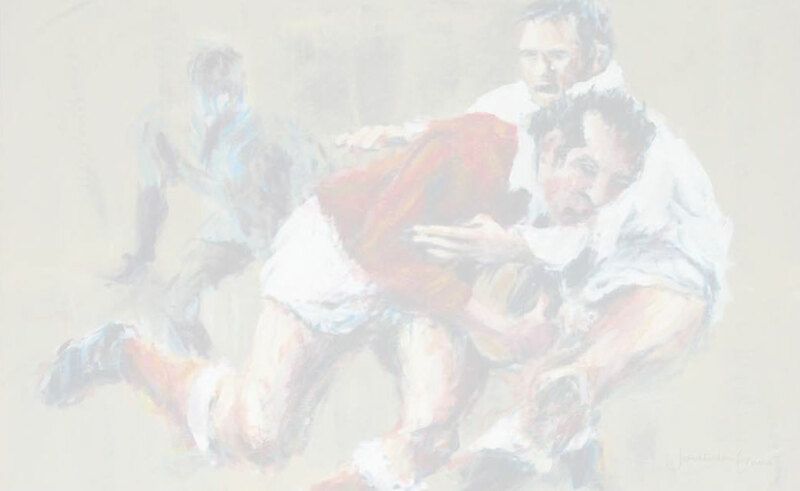 In tune with the year of the Grand Slam, the total print/canvas run is limited to 2005 and each canvas or print is numbered individually and accompanied by a Certificate of Authenticity. * Why pencil - pencil is almost impossible to forge, the test, just take a small area and an eraser and the pencil rubs out. A printed signature will not rub out. Silver Strike Print Plus gives you the option to choose your own limited edition number. Why choose your own number ? 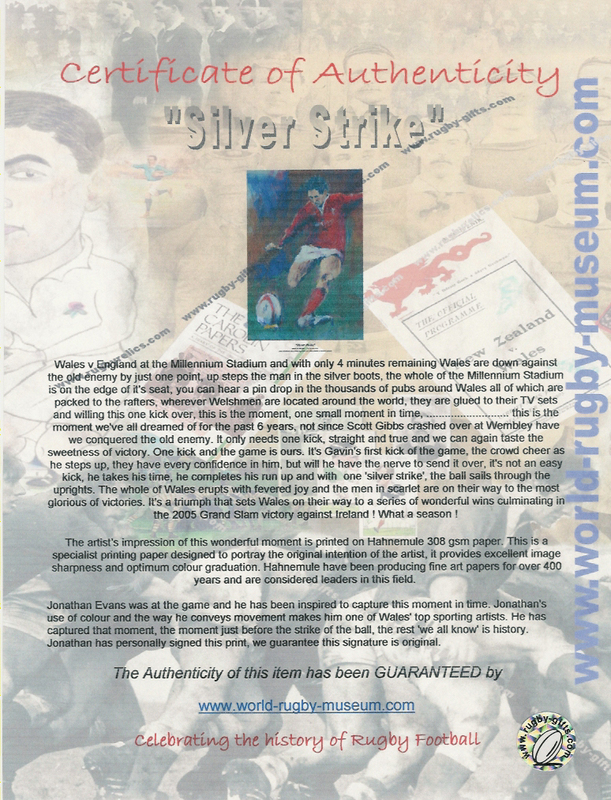 Silver Strike is available as a print on canvas, printed onto a 24" x 16" (63 x 42cm) canvas. The words and numbering do not appear on the bottom of the canvas, it's striking appearance is that of an original painting. The canvas will arrive on an internal frame, for framing. Silver Strike Canvas Plus gives you the option to choose your own limited edition number. Why choose your own number ? Add price below to your choice of print or canvas.